opportunity to have their voices heard at the State Capitol in Albany on Tuesday, May 7, 2019.
yourself as a resource to policymakers as tax experts. you are prepared to promote the Enrolled Agent Profession. This is a prestigious Members Only event that you will not want to miss! The legislation that NYSSEA has supported has not yet been acted upon by the Governor. The Government Relations committee has kept in contact with the sponsors of the legislation, Assemblyman Magnarelli and Senator DeFrancisco, and NYSSEA will be contacted by their offices when the legislation is eventually called by the Governor’s office. The legislation we have supported has been passed by both the Assembly and Senate. It now must wait to be called up and reviewed by the Governor before the Governor will decide whether or not to sign this legislation into law. This process is expected to take months because of the volume of legislation passed at the last minute in Albany. The Governor will call up each of the bills and review them with his staff, in this case DTF, before taking any action upon the legislation. As a result of NYSSEA’s 1st Legislative Day, we were approached by Assemblyman Magnarelli’s office to write draft legislation to amend NYS §3006 to add language that would parallel §6304 of the IRC to prohibit DTF from ignoring or bypassing the POA held by a taxpayer’s representative. At the January meeting of the NYSSEA Board that draft legislation was approved and Assemblyman Magnarelli introduced Bill A5359. Michael Lawrence, EA approached Senator John DeFrancisco, Chair of the Senate Finance Committee, to introduce companion legislation S3956 in the Senate. 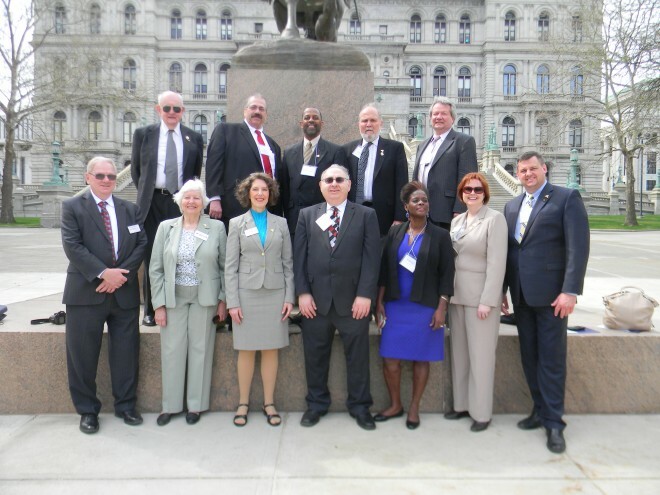 On May 5th NYSSEA hosted it’s 2nd Legislative Day. 15 members from across the State met with 27 members of the Assembly and Senate. In addition, Ann Kummer, EA CPA; Ken Kohlhof, EA; Don Rosenberg, EA; and Michael Lawrence, EA were able to sit down with the staff of the Assembly Ways and Means Committee and discuss the committee’s reservations concerning the wording of the proposed legislation in Bill A5359. In the Senate, Bill S3956 was referred to the Investigations and Government Operations Committee and favorably reported out of committee May 19th. In the Assembly, Bill A5359 was referred to the Ways and Means Committee and after our meeting on May 5th, Ken Kohlhof, EA took the lead to follow up on their concerns and we are waiting to hear if or when the Ways and Means committee reports the bill.